About 70 percent of the gutters installed on homes today are aluminum seamless gutters. Aluminum offers an affordable and durable material for gutter systems, are easy to install, non-corrosive and provide good service for many years. Aluminum gutters systems are suitable for many different types of home designs and roofing materials. Their moderate price also makes them a good choice for many homeowners. Steel gutters provide years of use, and galvanized coatings help to prevent corrosion. However, steel gutters are heavy and are not suitable for some structures. They can provide additional strength in areas with heavy winds or snowfall. On the higher end of the price scale, copper gutters give homes an elegant, upscale look and maintenance is easy. 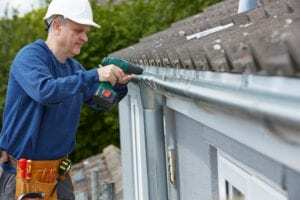 However, copper gutters must be fitted properly to function properly. Their higher price pays off with years of wear. Vinyl gutters are the lightest in weight for easy installation. Vinyl is also one of the most cost effective gutter materials. However, you should be aware that vinyl may not last as long as aluminum or other metal gutters.